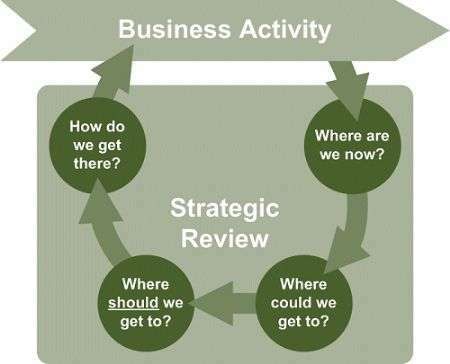 When I talk about doing a strategic business review, some people recoil with apparent horror, thinking it will be very complex. Actually, it’s a fairly simple process – which isn’t to say that going through it may not be quite demanding. It’s a bit like taking an old watch apart to see how it works, and then reassembling it with care and some lubrication, so that it will work better. I use a four stage process, adapted to the particular needs of each client. Sometimes, the situation is complex, and we have to go to some depth in each stage to be able to come up with the right answers. Other times, we step briskly through the stages because the situation is much simpler. In this post, I’ll briefly describe the stages. If you want more information about how this could apply to your own business, please contact me. The objective is to use some structured time away from the flow of business activity to assess how the business should move forward. The process is designed to enable a clear consensus to be established on what needs to be done, based on thorough analysis of the current position and available options for developing the business. This stage involves analysing the company’s strengths and weaknesses, how well it addresses the needs of buyers and markets, and how it compares with its competitors. I often engage people in a Competition Workshop where they can begin to understand how competitive their organisation really is. An assessment of operational effectiveness will be done, that looks at people, processes, and organisational responsibilities. The purpose is to establish a solid and agreed start point for the remainder of the project. This stage often highlights differences of opinion between people within the company, and builds consensus about what needs to be done, and why. 2. Where Could We Get To? In the second stage, the strategic options are identified. Research and analysis includes the sizing, profiling and segmentation of markets, and considering the options available for development of products and services through options such as organic growth and strategic partnerships. 3. Where Should We Get To? Based on the analysis in the first two stages, a selection of the appropriate objectives can be made from the strategic options that are available. This includes the selection and prioritisation of the initiatives that will be required. Deeper research into the chosen market opportunities is often required in order to complete this stage effectively. In the final stage, an operational plan is developed, based on the differentiated value proposition that has been developed during the first three stages. The offering to each market or market segment is defined. The requirements for the development of the company’s people, processes and organisation are defined. Targets are established in this stage, along with the definition of the metrics that will be used to evaluate success. Of course you can organise your strategic business review without outside help. But in my experience, it will be done more thoroughly and effectively if you get assistance. Perhaps most importantly, the review will get done. Why not investigate hiring me as your consultant? He is a clear and insightful thinker and was a great pleasure to work with.